Vacation feeders and “toys” for turtles…reptile care supplies certainly have come a long way since I started on my pet care and zoo-keeping career! Today I’d like to highlight two new automatic feeders designed especially for turtles (I believe both will be useful for African Clawed Frogs, Mexican Axolotls, newts and larger fishes as well). Exo Terra’s Automatic Feeder represents a great step forward in turtle care, allowing for 4 daily feedings of different foods over an extended period of time. 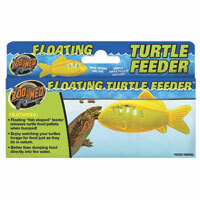 The Zoo Med Floating Turtle Feeder, while not technically a “toy”, will keep you and your turtles entertained. Similar to behavioral enrichment tools and activities I employed at the Bronx Zoo, this feeder forces turtles to “work” for their meals, thereby encouraging activity and foraging behaviors. It will be awhile before someone tops this excellent product. Powered by 2 AA batteries, it allows for the scheduling of 4 feedings per day. 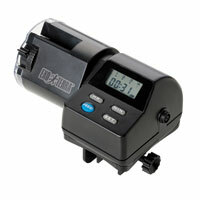 Meal-timing, and even the type of food, can be varied at each feeding, and the digital readout screen is large and easy-to-see. The Eco Terra Feeder could, for example, be programmed to dispense Tetra ReptoMin, Zoo Med Aquatic Turtle Food, Freeze Dried Shrimp and Zilla Clam Treats in a single day. I especially like this feature, as I’ve long been a proponent of providing dietary variety to nearly all of the creatures under my care (I say “nearly” because some, such as Eastern Hognosed Snakes, Snail-Eating Turtles and Giant Anteaters, have thwarted my best efforts!). The pellet chamber can hold 6.7 oz. of food, which translates to quite a few pellets (check your turtle food containers and you’ll see what I mean). Several friends even use it even when they are home…the chamber’s clear plastic cap allows them to easily see when refills are needed. “Behavioral Enrichment (BE)” – providing captives with opportunities to explore, play, forage for food and engage in similar activities – has long been recognized as essential to the health of mammals in zoo collections. Recent research has shown that birds, reptiles, amphibians and others benefit as well. Interest in the environment is stimulated, natural behaviors are reinforced and activity levels increase, all of which helps to maintain good health. Today, all well-run zoos mandate enrichment activities as part of normal protocol…at the Bronx Zoo, reptile keepers are required to list the BE provided in their daily logs. Even the occasional use of “BE” is beneficial. For example, when I release live shrimp into turtle exhibits once weekly, the turtles living there explore every nook and cranny of their exhibits each day…much more so than would otherwise be the case. The Zoo Med Feeder is designed as a floating, translucent-plastic fish. 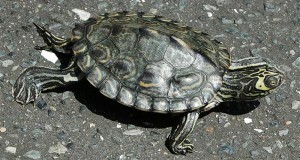 Pellets are released as the turtle bites, bumps and claws at the device in its attempts to feed. By putting in fewer pellets than the feeder actually holds, you can make it more difficult for your turtle to reap its reward, thereby extending its “exercise time”. My 44-year-old Common Musk Turtle is as enthusiastic as my hatchling Reeve’s Turtles when the Zoo Med Feeder makes its appearance. Please let me know your own thoughts and experiences by posting below. Both of the feeders described above are intended for use with aquatic and semi-aquatic species such as Red-Eared Sliders, Cooters, and Reeve’s, Map, Painted, Musk and small Snapping Turtles. The Exo terra Automatic Feeder, and possibly the Zoo Med Turtle Feeder, will also be useful to those who keep African Clawed Frogs, Axolotls and newts, and pellet-feeding fishes such as Cichlids and larger catfishes.